Despite the polemical subtitle, a scholarly and meticulously researched account of Jewish participation in the slave trade in the British colonies of the Caribbean and in the US. In 1991, the Historical Research Department of the Nation of Islam published an inflammatory document entitled The Secret Relationship Between Blacks and Jews, which charged that Jews had financed and dominated the slave trade in the American colonies and early US. According to Faber (History/John Jay College, City University of New York), this study’s conclusions have been widely accepted as fact, despite grave defects in historical methodology, with deleterious consequences for historical scholarship and race relations. Here limiting his study to slavery in the British Atlantic colonies in the 17th through the 19th centuries, the author uses primary source material, including shipping and tax records and other commercial documents, to refute the anti-Semitic theme of The Secret Relationship. 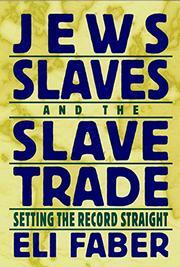 Faber concludes that Jewish involvement in the Atlantic slave trade was exceedingly limited: by successively examining the small, (initially predominantly Sephardic) Jewish communities of Barbados, Nevis, and Jamaica, and mainland colonies like Newport and New York City, Faber persuasively demonstrates that Jewish participation in the slave trade in each area consisted of tiny percentages of slave sales and ownership, from the earliest years of settlement through the abolition of the slave trade in the 19th century. A well-researched study that neither allocates blame nor exonerates the participants in the peculiar institution, but puts to rest a pernicious anti-Semitic libel of recent coinage.